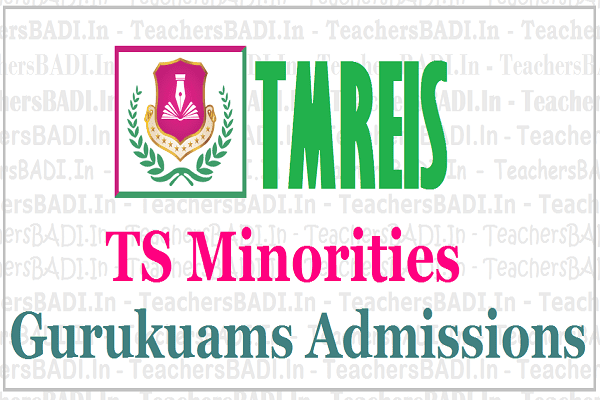 TS Minorities Gurukuams Admissions 2019, Telangana Minorities Residential School Admissions 2019, TMREIS 5th,6th,7th,8th,9th Classes Admissions, TMR Schools Admissions, Govt. Hostel / Residentials we have a clear picture that it is of half - boiled rice, vegetables, no proper classrooms, dormitories, beds, classrooms, wash rooms / toilets, no water facilities, proper drinking water. Which it is a place of adjustment of students due to various reasons like their background etc. So, many people think awhile whether to join them in hostels or not? But now this is going to be change and students of minority Gurukuls are going many new facilities. The well equipped infrastructure like Bed, cupboards, good classroom, modern kitchen ware, library, water plant for fresh drinking water,lab for practicals. The things which are going to be utilised in Gurukuls are exhibited in state seminar in Hyd. Telangana Minorities Residential Educational Institutions Society (TMREIS) issued official notification for admission of students into 204 Telangana Minorities Residential Schools across the State for the academic year 2019-2020. For this academic year, admissions of students in TMR Schools will be based on a lucky draw. However, from next academic year onwards, admissions will be held based on the entrance exam. This will ensure only merit students will get a chance in these schools. 25% seats - SC,ST,BC & OC. 5. Classes start from: 01-06-2019. According to minority welfare officer, Before April 20th login to https:// tmreis.telangana.gov.in and apply. The eligible candidates from minorities and non-minority communities in the State have to submit online applications for free of cost through TMREIS official website tmreis.telangana.gov.in. For new admissions into Class V and against backlog vacancies into classes VI, VII, VIII and IX in the 204 TMR schools, the availability of online application started from 25-02-2109 onwards and the last date to apply is March 31. Caste , income, date of birth, Aadhar cards should be produced at the time of application. At the time of admission TC, bonafide, progress cards should be submitted. TMREIS is on a mission to protect and promote Urdu among the next generation of students. “To make that happen, for minority students, TMREIS have made Urdu language compulsory while other students will have the option of choosing subjects based in their personal interest, and to improve creativity and life skills in students, a robotics lab will be introduced in TMREIS schools from this academic year. Through the innovative robotic lab, students will get exposure to advanced technology.